Published on January 15, 2012 in Culture, General T&T, Hindu, India, People's Partnership, Politics and Race and Identity. 47 Comments Tags: Kamla Persad-Bissessar, Politics, State Visit to India, Stephen Kangal. 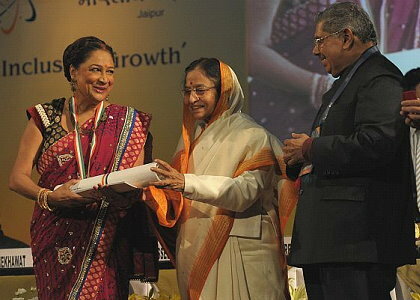 Prime Minister Kamla Persad-Bissessar attempted to touch the feet of The President of India, Shrimatee Pratibha Patil in true Trini Hindu-style of performing the “goar lagay” after receiving the Pravasi Samaan Award in Jaipur. The question is whether she has compromised the concept of the sovereign equality of states and infringed the secular configuration and contours of governance by this Hindu act of humility, respect, diplomacy and submission. The “Goar Lagay” is a universal Hindu traditional ritual performed by chelas to gurus, children to parents and parents to grand-parents especially after doing “artis”. That ritual is based on the view that the feet are in close physical contact with the cosmic energy force of Dharti Mata (Mother Earth) and accordingly touching the feet of gurus/parents is tapping into this energy force to renew and strengthen the cosmic energy manifested in and that drive all our actions. Having said that India was her ancestral and cultural grand-mother in the opening statement it was consistent for her to touch the feet of The President Head of State of India. This act alone won the hearts of a billion Indians at home and thirty million abroad for T&T. Accordingly there is nothing secularly objectionable in this act that demonstrated humility, connectivity, ancestral and cultural connexion with India since the Indo-T&T in the PM cannot be separated her official status as Head of Government of T&T that is officially a multicultural society. The PM amalgamated international politics, state diplomacy and ancestral culture in one grand master-stroke. IT’S TOTALLY BASED ON YOUR BELIEF ……I HAVE GROWN UP KNOWING GOD IS GOD ALONE WHO SAID THAT WE ”HIS CREATED BEINGS MUST NOT BOW DOWN TO ANY IMAGES MAN OR BEAST OR ANY GRAVEN IMAGES…..BUT AGAIN IT IS LEFT UP TO YOUR INDIVIDUAL BELIEF ………THERE IS ONLY ONE GOD AND CREATOR. Hindus believe in the pantheistic doctrine of God manifesting Himself in all creation and in several ways including gods and goddesses. I think that Catholics kneel down before the altar. “Goar” is the bojpuri word for feet and “lagay” is the act of touching and bowing to the feet of the guru/parent/ or community leader. If the Prime Minister’s trip was a pilgrimage then so be it, she can convince us or Stephen Kangal can convince us that whatever Hindu rituals that she may have participated in was foe her hindu beliefs and not representative of the beliefs of the vast majority of the people of Trinidad and Tobago. This government has flirted with the concept of hinduism as part of our national religious faith and uses every resource that is available to push it whilst at the same time saying that we are multi-cultural. There is a sort of marrying the hindu religious practices when high ranking government officials such as the PM, AG, Foreign Affairs minister, and Education minister to name a few perform their normal duties and that is ok to a point. When the act of worshiping a human as god then saying that it is done for our christian brothers and sisters in T&T, then the act of the PM becomes objectionable, because our god is a just god and no man or woman living on this here earth can be used as substitute. I am not saying that this is what the pm is saying but rather what the write is trying to convey. Most of the rituals that is constant with hindu practices are pagan in nature and therefore presents a problem for `those of us who are non-hindus to accept these practices. You appear to forget that it was the last Prime Minister who attempted to rule the multi cultural and multi religious T & T by taking advice from a Spiritual Adviser and going so far as to carry her on his various Governmental Business trips all over the world at the expense of the T & T tax payer. And using tax payers money to build him a house of worship on state lands. So don’t come on this forum and push your biased comments. Secondly you calling one religious body “pagan worshipers” well Christinity is full of examples of pagan worshiping just read the Thora and the “old bible”. Look at all the saints and drawings of angels in othet houses of worship. Does the act of “washing of the feet” jolt your memeory?? The act of touching another person reverently is well established in all religions worldwide, just look at your muslim brothers who openly hug and kiss each other when they meet and listen to their arabic greeting when they do so. Be more pro active and tolerant of others and you will find a place in heaven. “Humility is a significant lesson for mankind.” I agree with this statement 100%, in a perfect world. Humility is a necessary attribute for a life of content; but humility towards the Supreme Creator/The One: Pagan ritual acts of veneration to and for creatures, are for the uneducated; useful as a teaching tool by ancients who wanted to instill that sense of respect and reverence for the Creator and Nature when Gnosis was the province of a few; and like those old “racial” films of evil African witch doctors, should become absolete. Mutual respect renders these obsolete acts to the realm of mere humiliation. In India we say……SAY WITH PRIDE …. I AM A HINDU. And that is what Kamla has consistently done from the time she landed in Delhi until she departed from Mumbai. You had to be in India to feel OUR warmth for your leader and your country. Oh no! We felt the ground move when she landed and participated vicariously in her warm and affectionate welcome by the Indians. These South Asian female politicians , and their closet imperial penchants ,always make me laugh, and our PM seem to suddendly in one stroke, to have joined their antediluvian ranks. Check the record, and you would see that they are collectively worst than their male counterparts fathers , and husbands who ensured their power. Queen Indera Ghandhi, presided over Sterialization of poor Indian women , and two stupid tribal wars, with Muslim cousins from Pakistan. Her foolhardy, arrogance, and sociaslist obsessions ,eventually cost the life of her two equally clueless delusional sons. Princess Benizar Buttho, ran around in jeans ,mini skirts, and halter back jersey out fits, while studying in England, or was it Oxford, then returned home ,to an arranged marriage , and lord over the most corrupt regime known to Pakistan . The first line that jumped out at us, upon her death, was a will left to her crooked Mr 6%, caretaker Presidential husband, to hand over the reign of power to her Oxford pimple face son , once he comes of age ,and what a traversty. In Kumaratunga and her crazy mom, Sri Lanka had two of the most evil ,fake compassionate Buddhist ,leaders, in the world ,in terms of genocidal policies against Tamil country men. As for Bangladesh Khaleda Zia, her country remained one of the poorest in the world , where just like India , Pakistan , and Sri Lanka , women, girls , and kids generally , possess absolutely litte rights , while these nepotistic ,elites ran the show for so long. Thre was so much hope that T&T would be spared this idiocy , once Kamla destroyed the hopes of criminal Basdeo Panday, via her UNC over throw- with the help of course of Uncle Jack de Queen Maker. My heart goes our to our desperate Indo Trini kids, and womenn , as many likewise ,have endured some of the worst form of barbarianism, known across the Caribbean. Let’s hopwe that Her Majesty Queen K, can pan out to be more than window dressing,as her fans keep looking over their sholders, like Lot’s wife with idle commentaries, about Patrick Manning , and his PNM . We wish our people well, and yes, I agree, wholeheartedly ,with my fellow progressive, humanist friends, that we should say ,enough with neo – paganist rituals- irrespective from whence they emanate. India has arrived a long way mate. India under Late Indira Gandhi cut Pakistan to size. India emerged dominant in South Asia. Stretegic balance shifted in favour of India. Empress Indira will always remain in our hearts. She and her father Nehru are Indian ICONS. Have you ever been to India? Better shut up. Sunil Sharma JAIPUR, while you have the right to be stupid, you do not have to overdo it. Neal, Kamla and the Hindu hierarchy are doing what Black Trini leadership has been unable and unfitted to do … represent their people effectively against marginilization. In short, what TnT is witnessing, in fashion brazen, dismisssive and thereby useful, is the re-colonizing of the country. According to the Hindu leadership this has always been in the cards. They vehemently opposed independence, then slated to occur under Black leadership as that of Dr. Eric Williams. My conclusion–and here I again hope that I am 100% wrong–is that Hindu options were probably either TnT remaining a protectorate under the British–as is Bermuda under Britain, and Martinique under France–or failing that, replace Caucasian colonization by S.E. Asian colonization. It is not their fault that the Black leaderships–if they can be called that–have been ineffectual and compromised. If there is anything useful to Black Trinis about this, it is how open and ‘don’t care’ is the current re-colonization process. No subtlety needed here. In fact, even Black lesdership in the UNC is already being severely circumscribed. Ask Jack Warner how he presently feels about bowing down to Hanuman. The distressing aspect is that Black Trinis, like Black people elsewhere, apparently best read the handwriting on the wall of calamity when their backs are up against the wall of inevitability. My prediction–again, hopefully inaccurate–if this process is not addressed by patriotic Blacks, Indians and others is that by the year 2050, the Black presence in TnT will be more notable by its absence; an absence that will reduce the Black presence to that which is akin to that of the Santa Rosa Amerindian communities: museum pieces of cultural, financial, political and social marginalization. These marginilizations have already occurred elsewhere, for example, in India’s Andaman Islands, Black populations once indigenous more than 60 000 years ago, now number in the single digits. Other places closer to TnT, for example Argentina where 19th Century Black populations once numbered 50% plus, they are now less than 2% and declining. And I thought, wow, this decline of Black people in T&T is symbolized in our national flag! In the words of the designer, Carlysle Chang, the black stripe in the flag represents “the largest ethnic group”, as black people were at that time. But officially, no reference is made to that. Officially, black represents “strength” (see cited clip @2:09-2:47). If the black in our flag represents, in the designer’s mind, the black people of T&T who took the country to Independence, then what we see symbolized in the flag is black at the top in the beginning, sliding down to the bottom, along a channel guided by two white stripes, in a sea of red. So what the flag says is that the black ethnic group is to slide to the bottom, under the white and the red. If black symbolized black people in the designer’s mind, it is no stretch to imagine what was symbolized by the white and the red. If that is the “voodoo” in the flag, it certainly has worked. In this light, it is interesting that one other rejected design alternative, the first presented in the clip, had a broad vertical band of black next to the flag-pole, along with two other vertical bands, one of white in the middle, the other of red (see clip @ 0:35), the black and the red of equal width, the white of lesser width. Why was that design rejected, I wonder? In hindsight, I would have to say that accepting the Carlysle Chang flag design was one of the mistakes that Eric made. Arguably, Chang should never even have been given the assignment. At any rate, neverdirty, in the context of your marginalization hypothesis, I thought I’d mention the symbolism of the flag. Is it any wonder that those who so agitated against Independence, should now play the super-patriot and, in effect, appropriate the flag as their party symbol? The Book will be fulfilled. Therefore, I fear not. Let the enemy, implacable as he has been, do his worst. It would be usefull for someone to explain why it was appropriate for Trinidad and Tobago’s Prime Minister to touch the feet of the Indian President, and why this ritual was not performed the other way around. Should the Indian President have touched the feet of her guest, the Prime Minister of the Sovereign Independant Republic of Trinidad and Tobago, or are we, under this administration, now happy to acknowledege a superior status for India, in a way that we have long rejected for the United kingdom? The President represented her “grand-mother”, was of superior status being the Head of State and older than the PM. The President was also giving the gift to a younger person who is her guest. All these factors will justify the bowing to the feet by the PM in accordance with the protocol of the Hindu ritual of the “Goar Lagay” and not the other way around. Maybe Ivor St Hill, it’s simply an acknowledgement of Her Majesty Queen K, that she is the low caste member of the tribe, whose ancestors departed de shores decades ago, and so deserves to kiss the feet of her superior? Maybe it’s an indication that European Imperilism has won out, as Black ,Yellow,Red, and Brown folks ,mimic their more adorable White Royal counterparts, by these arcane gestures? Maybe we, like most across the conscious globe , should in actuality , pay less attention to characters such as Mahatma Gandhi, and VS Naipaul, but instead ,more to giant intellectuals such as Frantz Fanon, who denounced neo imperilism , at the hands of petit elites? During her short but very telling performance since becoming Prime Minister a lot is beginning to unfold about her majesty, queen K.
Hinduism as it’s ultimate goal. Whatever it takes top get there, will be done, even bringing a few Africans on the ride to get there. Hate, envy and victimization will follow the path to realizing her goals and that is why Reshmi was no accident. It was profound in the sense that in spite of the money, security concerns and desire for national protection, she appointed a lowly uneducated and simple hindu girl to do the job that most people believe is one of the most important jobs in the country. Catholic, Anglican, Methodist, Penticostal etc), the adding of the Baptist was never an honest reaching out for brotherhood but it was important to show that they understand the plight of the African. The assignment of Devant, Rambachan, Gopeesingh, Anand and others are important pillars to achieving her goals because they espouse not the Trinidadian ethos but a vision towards mother India who should be directing us to the Indus river. There is hardly anything ‘Trinidadian’ about her stewardship, so on her recent visit where she invoked the memory and adventures of her ancestors, it was in effect a revival of the spirit that the many gods of hinduism has enlightened her as prime minister of Trinidad and Tobago to pursue. She was so moved by the practices of what many in the Christian world consider pagan, that she did not mind that as a visiting head of state she should be more pragmatic. What is next for us is a continuation of the same until sometime, somewhere the inevitable will have to be faced vis-a-vis the concept of multi-culturism. The present prime minister of England, Mr. Cameron has dismissed the idea of this concept because it pits people against each other. It favours one against another and there is no such thing as equality under this type of vision. The only thing to come from it will be eventual disaster. Kian, your analysis might be reasonable, but obviously biased. You seem to accept Christianity and its practices as the official principles of T&T, but at the same time you call for the separation of church and state. Let us not pass judgement on any one’s religious beliefs. I tend to be more open minded and sincerely hope that you are incorrect about the PM’s India agenda. T&T will never accept any Hindu agenda and I believe that the PM is smart enough to know this.As regards multiculturalism, T&T has and always been a guiding light as a nation which has written the blueprint on this topic.Making multiculturalism an official policy changes nothing.The people of this country already live their lives as exemplars of diversity, accepting and celebrating their neighbours. T&T is still a democracy.The government and its policies will be judged at the ballot box and it seems that you are campaigning early. Still slurping dem stale Canadian Maple leaf Gins, ehh T-Man, even long after your ‘white , sky god Christian Xmas,’ is over ehhh? Who , or what, is trying to curb anti multiculturalism,and diversity,or worst yet, might be against accepting and celebrating their neighbours? Glad you recognize that T&T is still a democracy, but remember , it did not just evolved that way ,over the last two or less years, Her Majesty Queen K, started her reign. In case you and other fake Euro Canadians ,did not know, this entail freedom of speech , to criticize any Feudalistic , feet kissing behaviors, we see our public officials- especially elected leaders- engage in. As my fellow nationalist ,Frontsman said, she and her main squeeze, Dr Bissessar is free to walk bearfeet Mahatma style, over the next three years ,speak only Hindi for the rest of their lives ,or better yet take 3 weeks vacations , every other month ,to her ancestrial land India , as that’s her right, but as the PM of our country , any actions, that would make our Soverign state ,with it’s collection of sophesticated peoples,look like boobolies internationally , will get the most tolerant amoungst our citizenery , up in arms. In like manner we had no qualms when you guys ran for the European shores , with your Trini spoils back in 1986 , as that falls under the tenets of your fundamental Human Rights, but to have the audacity to claim refugee status due to genocides committed by, ….well, you know better than me , so fill in de blanks. Blessed New Year, and welcome back, my friend. I miss your thoughtful commentaries , my frind. TMan welcome back and I look forward to seeing your active participation once again in this here place of market ideas. However, I must first take you to task in saying that my analysis might be reasonable but I am biased. I believe that it must be one and not the other. The objection to Kiamliar’s behaviour is plain and simple and whereas the hindu religion is being scrutinised in the process we must be open minded and open hearted in understanding what is being said. We in Trinidad and Tobago believe in freedom of the press and freedom to serve any religion or religious persuasion but Kamliar’s visit was purposely advertised as a state visit, NOT a religious visit or pilgrimage. It is in this context that Kamliar’s behaviour is being attacked. If she had entered the building asking that she not be quoted or followed because what she was about to do is personal, I am quite sure that she would have been excused. But she went and kissed this woman’s feet because she represented India and Kamla represented Trinidad and Tobago! What? Trinidad kissing India’s feet? . What is there in this situation for me as a citizen to feel proud about? I am deeply insulted and she should be taken to task for inflicting such stupidity on the backs of Trinidadians who do not subscribe to acts of pagan worshiping. While I am personally not in favour of ascribing the cross on the national awards I had no problem with it BUT the hindu and muslim successfully argued that the name discriminated against them. Reason prevailed and the cross was changed. So, tell me now, why should the majority of Trinidadians (Chrtistians and muslims) be subservient to the religious practice of kissing a big toe! My take is, if the visit was made by Mrs. Kamla Persad-Bissessar, wife of Dr. Bissessar, then such acts would have been ok, but this was a State visit by the Hon. Prime Minister of the Independent Republic of Trinidad and Tobago. But I have learnt over the years that people would always have a reason or excuse for their wrong-doings or stupidity. I also agree with the writer who stated it – very soon we could be a colony of India under this Government. These fellows seem to be SULKING. Kamla Bissesar has only acknowledged the goodwill towards her in India in a HINDU way.Are HINDU gestures banned in Trinidad and Tobago? Why are you inflamed by her HINDU ethoes? Not quite the same thing, but it still reminds me of the Fox News take on President Obama bowing to the emperor of Japan. “Not quite the same thing….it still reminds me of…. President Obama bowing to the emperor of Japan?” Correct Ravi Singh ,though we understand yours and other ardent fans excusse , still ,this pityful , face saving cyber defense jesture, is quite an idiotic comparison. Half White Yankee President Barrack Hussain Obama ,showing some respect for a Japanese Emperor, ain’t the same thing as having ‘Her Majesty Queeen K,’ returning home to de ancestrial land, only to find herself on BBC , CNN, Aljazzera, de Toronto Sun, Hindu Times , and de Urdu Sentinel,kissing the big toe of another humman being. What next Ravi , her curtseying to Octogenerian Queen Elizabeth 2nd? Folks from independent Republics such as ours, have no need to resort to such neo imperialist actions, as it send’s a bad message. Seriously Ravi ,here is a better reference ,from Yankee land, since we now wish to elevate lowly 3rd world countries , their leaders , and follies, with that of more advanced nations. 20 years before, on a trip to Japan , Pappa G H Bush , vomited, in his Sushi soup. ‘Me think,’ then too,dat ‘Faux Five News ,’ saw it as maybe Yankee retributions, for Heroshima , and Nagasaki Genocides committed, Harry Truman in 1945. Earthly ,Samsara, we Hindus say! “THE ultimate subservient of superiority and inferiority being demonstrated”. This was how Opposition Leader Dr Keith Rowley described Prime Minister Kamla Persad-Bissessar touching the foot of Indian President Pratibha Patil during a State visit earlier this month. Persad-Bissessar returned from a two-week trip to India on Sunday. Rowley raised the issue which he described as “unacceptable” during a political meeting held by the People’s National Movement (PNM) at Febeau Open Bible Church Tuesday night. “I am a citizen of Trinidad and Tobago and I take umbrage at my Prime Minister going to anybody’s country and kissing any office holder’s foot,” Rowley said to loud applause. “I am not concerned about her religious persuasion in this country… We are very tolerant,” he said. Rowley said Persad-Bissessar was representing the country and should not have bowed to touch Patil’s foot. “Nobody sent the Prime Minister abroad to represent her religion or her race. She went abroad to represent all the people of Trinidad and Tobago and, however, she feels when she stands in front of the head of government or the head of state she must stand there proud representing the people of Trinidad and Tobago,” Rowley said. “That is the ultimate subservient of superiority and inferiority being demonstrated. We past that stage since the world was told by Eric Williams (former prime minister) that we will not be doing that again and India was in the forefront of that,” he said. Rowley referenced a Times of India newpaper story which stated Persad-Bissessar “went too far to demonstrate her Indian-ness”. “India’s independence was the first of the British colonies. All of us followed after and I am sure they did not expect that our Prime Minister would come and kiss their leader’s foot,” Rowley said. “So of course now we expect according to her logic if (US President Barack) Obama ever goes to Kenya he will bend down and kiss the foot of somebody in Kenya because his grandfather came from Kenya,” Rowley said. “That is unacceptable and we dismiss the excuse makers, we are a proud nation. When India votes at the United Nations if we vote differently we cancel out India’s vote, one billion people against one million people. We are equal in the eyes of the world. Size and power are no longer your station in this world,” he said. Rowley said if Persad-Bissessar went in a private capacity he would not have raised the issue. “That is personal, that is private, if you go there on your private capacity you could do that. If you go there in your personal capacity you can do that…I will have no argument with it but when you represent all the people of Trinidad and Tobago, do not go and kiss anybody’s foot on my behalf. Do not do that,” he said. “And when you wear Trinidad and Tobago red, white and black we do not defer or bow down to any nation in this world. We meet you on the cricket field we beat you, we meet you on the race track we beat you, we meet you in the university we beat you, that is Trinidad and Tobago. We are equal to all and inferior to none that is how we are building this nation,” Rowley said. Well, ‘me think dat de political dastraction spin marchinary,’ is out in full force, and how sad indeed, when real ,and important issues, are still lying dormant, across our wonderful nation. Stay tune , and much luv T&T. What is the objection? I thought that Mrs. Bissessar performed the ritual with style and grace (and it probably made us some friends in India!) There was nothing subservient about it. I bet most people treat their local grbage man the same. “He throws that trash with such elegance”, says the elite working class proffessional who lives far from the garbage man. I hear that it is styilish and yet gracefull for the People of Trinidad and Tobago to be submissive to all. Why should we agree on our offshore fishing boundries when we can just bow out gracefully? Why be a independent sovereign nation if we can just with grace and style become part of another nation? Where is our backbone, on the floor, or was that what Kamla was ending over? Actually, the man who delivers my newspaper has an overhand throw that our bowlers could usefully emulate. The gesture – touching the feet – had nothing subservient about it and it was satisfactory to hear Mrs. Bissessar replying to her critics by what she did not say. Once more Glenda,and de fans , who cares,really, as to what the PM ,Her majesty Queen K, does ,on a vacation junket to de ancestrial lands?Ain’t it clear as to what resource starved India , and neighbor China , are looking for, amidst all this pretend love, posturings? Wake me up when your government rolls out an employment plan. We wish the folks of T&T well. Nation building sure ain’t easy, of dis we can be certain. No matter how you slice it, it is wrong for a leader of one nation to act as if he or she is not an equal to the leader of another nation. Last time I checked, Manning and his spiritual advisor contributed to his loss as PM. Acts like this by Kamla will do the same for her. This is a western world nation that deserves a western world leader. TNT doesn’t need some cowering leader to be submissive to other leaders. How will that move us forward? What do we tell our children? Do we tell them that although they are born free in TNT second to none, on a international stage we are inferior? I personally believe that the PM could have waited until she was out of office to make such a personal pilgrimage. What she did from a cultural perspective is one thing, but to do it as the PM of TNT is wrong. Rowly is right. There is no argument about that! I hate to beat this old dead horse, but again, info highway , cyber drivers, seems to be repeatedly missing the boat as it were when it comes to their own country’s socio- economic – com political reality. This big to kissing, suspicious ,Trini sell out manauver , has nothing to do with Hindustan as a religion, India , or acane gestures ,indulged in by grateful PM. It ‘s all about branding , and crafty gsme played by a competitive , though misguided Indo Trini Middle class-many of which have only assumed their power due to the stewardship of the same people they pretend to despise. We have been there done that before , in case one forget.The subtle differences are obious for the politically sophisticated to see. Basdeo Panday , successfuly used victimization politics to remain relevant ,in ‘T&T tribalistic politico prison cave .’ His successor , Her Majesty Queen K,an ardent student / protege,took the baton , but made a detor, as she and the PP, top bass advisors , saw racial/ ethnic pride,and selective demonization of the other , as a better ploy. Now as a different strategy, those of us who claim to care about their country , can quit belleyaching about a meaningless vist, and instead find a way to craft a dialouge, that would make desenfranchised young, old,educated , illiterate,and neglected, as well as confused elite citizens ,across the so call divide recognize, that they can gain more by moving beyong exterior features, political distractions. If he were PM and he did so, he would be equally foolish. If I were PM, I would not bow before any person. My nation and people have just as much to offer this world as any other. We (TNT) are second to none. Neverdirty wrote: In short, what TnT is witnessing, in fashion brazen, dismisssive and thereby useful, is the re-colonizing of the country. I agree 100% that this a brazen exhibition of the attempt to Indianize T&T. What we have to understand is that these people do not believe that they should live under any ruler who is not of Aryan origin. In any situation where that potential exist, they will set about to indianize the country, and if it means getting rid of the none Aryans who stand in their way they will. I will say this withy no apology whatsoever. There is no way any person of African descent can hope to live decently with their rigthts intact in any nation that is Governed by Indians. And when you look at Fiji and Guyana, and what is now emerging in T&T, you see the proof of what I am saying. When the indentured arrived in T&T and beheld dark skinned people with hair that curled like wool and did not lie down like straw, as theirs was, immediately they saw themselves making a caste transition upwards. Ever since the belief have been passed down from generation to generation. The unfortunacy is that we, the descendants of those who were enslaved, continue to assign “sacred cow” protection to this reality while the new Bramhins continue to displace their prejudiced heritage unto us. Like neverdirty wrote, Kamla and her tribal posse are not embarrassed or reluctant to parade their ethnic triumphalistic feelings before us and the world. It is we who continue to act like a zealous suitor begging to be integrated with people who do not see us as equal to them. And this is very amusing when we exist in region where we enjoy a majority advantage, and understand that if the tables were turned and that majority was on the other side, the Caribbean would have already become Little India. We need to wake up and see the light and begin to educate each other, our kids, and our brothers and sisters across the Caribbean and SA. If we do not, we will become like the Africans on the Andaman Islands who are ordered to dance for tourists by members of the Indian Police Force. This is a miscrocosmic verification that Indian Power plus African Population = African Humilation. Wake up people. I am amazed that after a period of 167 years of the practice of Hinduism in T&T non-Indians still do not know and have not taken the time to know the religious significance of the ritual of the Goar Lagay. This is indicative of separatism in T&T and lack of multicultural education in the classroom. So who are you blaming for that Separatism, Uncle Stephen Kangal, none Hindus, or de insular folks, that dominate that ethnic tribe? After all, T&T none Indians are conversant with most of the meaningful Islamic, Jewish, Hare Krishna, and Buddhist practices, no? I am likewise certain that the 133,295,077 million of Muslims that constitute 14% of India, and the 100 million who fled to Pakistan, have no knowledge about these Goar Lagay rituals as well, do they? How about the marginalized , discriminated Christians , and Sikh communities? One can be assured that the millions of low caste Hindus scraping along on one dollar, per year, while their neo imperialist Hindu leaders, live lavish westernized lifestyles, locked in a useless nuclear arms race, are unconcern about this as well. Thanks Professor ,for your enlightenment on this subject, for if we waited on the likes of Uncle Kandal , and others , who acquired their info on that great Democracy , from the briefings of Indo Diplomatic Trade Missions , we won’t know the truth , as to what , might also be fueling the putrid politics, in places such as T&T , Guyana , Fiji , and Sri Lanka. For what do they all have in common? You bet ,and it’s an unnecessarily disgruntled , mainly male , intolerant Hindu bunch , who fervently believe , that everyone else , whether they wish to or not , should bend down like her Majesty Queen K , and kiss the feet ,of some earthly god . Fortunately, their plans, will, and I repeat will never work in T&T, an authentic ‘land of freedom and democracy,’ and what does that mean in actuality my phony Libertarian friends? You can practice your religion as much as you wish, but don’t seek to force it on to anyone else. This include discrimination against the poor, women, kids, and similar arcane , prehistoric policies , that will make the most savage , European , Afrikan , or Asian cringe in disgust. Nuff said. Ain’t it time for folks in T&T , to forget de tribe , and follow a more prudent admonition of ‘Luving Humanity! ‘ ‘ Me think, ‘it’s a fine enough approach to sustainable development. Enough with the stupid, political distractions, and glorification of Asian continental trade escapades , when Argentina, and Brazil’s Economy alone ,doubles that of India , and China placed together , and better de continent of Afrika ,has 900 million consumers , ready and waiting for the taking, depending on what we have to offer. Thanks Dr Vijay Mahajan. Just maybe one of the typically delusional policy wonks can whisper to her Majesty , that there is a whole untapped globalization resource that we can engage in , that can bring more lucrative national benefits – if dat is the end game of course, for some of the more cynical amongst us are drawing differing conclusions as to the real reason for these obsessions , with these two resource starved , undemocratic countries , ennnt? We wish our hodgepodge collection of people well. If a person cannot seperate their personal life from they’re public life when they are acting on behalf of a diverse nation of people, then perhaps they should not lead the nation. It’s not about taking the time to know the significance, but rather it is about our leaders representing all of us as a seperate sovereign nation apart from any other. This is not India and we are not citizens or an extension of India. This is a typical example of how ‘education’ is NOT an all-inclusive passport to an informed life. Here we have a simple subject matter of ‘respect’ and we cant agree on how it should be applied. The writer seemed convinced that those who dont understand goar lagay is ignorant of Indian practices. On the other hand people like me feel that we do not need to understand it, but when used or fashioned it should be in the proper context. This is where we take different roads to understanding and sometimes misinterpretations of the application of formed and accepted habits that is reverred and sometimes repulsive to others, depending on the occasion. Coming back to the word ‘respect’, it has different variations and applications in that it starts with family, then community, regional, national and lastly international. With regards to this argument the latter is where we are having the most problems with because it involves so many different aspects that borders on practice, beliefs and respect for written and unwritten norms and conventions. The United Nations is the foremost authority on this matter because in many ways it dis-regards, rich from poor, large from small, good from bad and friend from foe. When Kamla visits India on a state visit, she and her hosts are naturally applying “International” habits that is governed by international relations. Sometimes that means flying over enemy territories but having their consent before doing so. And this bring us to greetings and what it means. Although she personally shares the same beliefs as her hosts, out of respect for her fellow Trinidadians she should not act as though she is representing a Hindu country with practices accepted by the majority in her country! It is in this context that there is so much consternation. Keep your religious practices for yourself in international affairs. Privately, you can do anything you want. There are demarkation lines in how we apply our beliefs systems and we hope our dear pm will understand this. One does not have to like or not like India because we have a problem with Kamla’s behaviour but we believe that when she tried to represent some of us, she was ill-informed and downright dis-respectful. No matter how altruistic they might try to paint incident as ‘paying respect’, the way pagans govern is the strict application application of norms and practices. As an addition to my previous blog. People use respect to subdue other people and religion can be suspect in this regards. Stephen Kangal said that he cant believe that after 167 years the community at large dont understand goar lagay. When confronted by a high ranking British official, Mohandas Gandhi was asked how can the people of India and Britain unite? Gandhi did NOT go to the GITA, instead he opened the bible in Matthew and quoted Jesus sermon on love and said when your country and my country can live by these attributes we will not only solve our problems but the world’s problems as well. If a renowned hindu as Mahatma Gandhi, who was troubled by the virtues of huinduism because of the evil of its Caste system, can see the virtue of Christianity how come Kangal who was educated under all forms of christian concepts does not know the difference between Paganism and Christianity? Kamla and ALL the high ranking educated Indians received their cherished ‘education’ under a highly christianized system in Trinidad and Tobago so I cant believe how he is saying (in this day and age) that we need to know the goar lagay! A high ranking Hindu government in the PP government once scolded his grandson who hit a ball over the boundary playing cricket. The grandson was so elated at his achievement that he went to his grand father and told him that he hit the ball like Brian Lara. The current Minister ‘corrected’ his grandson that he did not hit the ball like Brian Lara but like Tendulka! These little incidents tell us a lot about who is governing us. If T&T prime minister touches the feet of his father………then you people will say that she is humiliating her country……come on people……..understand………..it is just respect to elderly people and very personal……dont take it as humiliation….. she is a hindu…it is the ritual of hindu……after all it is said that one who respect elders wins blessings…. indian politicians at least dont do that rituals in public…..thats why you find it new…. it is common in our culture…….why you all dont talk about her saree which she were wearing while in india….if that is not the point of discussion then the rituals too should not be discussed…… if POPE SAYS TO THE PRESIDENT OF ANY COUNTRY “GOD BLESS YOU MY SON” THEN MAY BE YOU PEOPLE THINK THAT THE PRESIDENT IS THE ILLEGAL SON OF POPE……..and you will be humiliated…..is not it…?? ?